It has recently been argued that gun violence should be framed as a public health issue and, accordingly, its study be allocated sufficient funding by Congress to permit better understanding and prevention of the problem. Since 1996 Congress has not allocated any funds to the Center for Disease Control (CDC) for such studies. 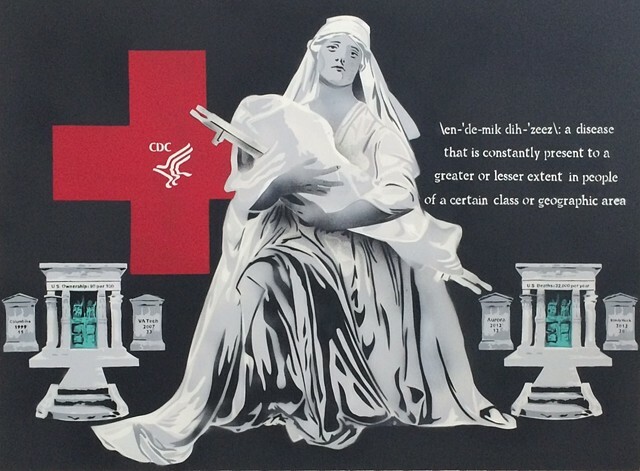 This painting is a representation of framing gun violence as a public health issue by classifying it as an endemic disease, a disease unique to the United States - an argument well supported by comparative country statistics of gun ownership and gun deaths. The central figure was appropriated from the 1918 poster created by A.E. Foringer entitled "The Greatest Mother in the World" the purpose of which was to encourage Americans to be volunteers to aid in the wake of the death and disease of WW I. As the war effort seemed futile to that point, the poster was one last mournful plea for help. Its imagery can serve equally well as a plea for Congress to fund CDC research addressing gun violence.